An Obama supporter celebrates in London. LONDON, UK — Four years ago, Europeans greeted Barack Obama's election with jubilation. This time it was relief at the prospect of a more stable world. While ordinary citizens confirmed overwhelming pre-vote preferences for a Democratic-led US government, leaders from across the continent welcomed not having to reorganize their Rolodexes. A socialist who’s made no secret of his preference for Obama, Hollande once joked he should endorse Obama’s Republican challenger Mitt Romney to sabotage his campaign. Britain's right-wing Prime Minister David Cameron also welcomed the election result for extending the relationship he’s built with Obama over the past four years. "There are so many things that we need to do,” he said. In Germany, Chancellor Angela Merkel reflected on how she had "deeply appreciated" Obama's cooperation over resolving the global economic crisis. Frank-Walter Steinmeier, a prominent German opposition politician, heaved a more audible sigh of relief, saying, "I was concerned that a President Romney would have further divided an already fractured country." Market reaction was mixed, with stocks by heading into the red after early gains. The down-to-the-wire election result saw much of Europe's media struggle to stay awake long enough to squeeze it onto their front pages. Several newspapers in France and the UK pushed final deadlines back to the morning hours to record the outcome. 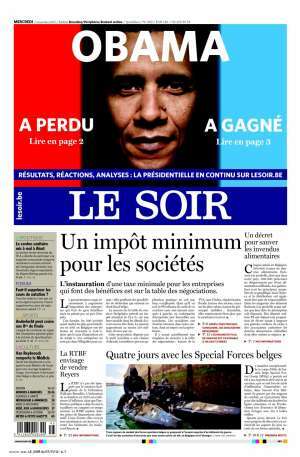 France's left-leaning Liberation daily declared its pleasure by clearing its front for a photograph of a cheerful Obama and a one-word headline in English: "Yes!" In Belgium, newspapers found a novel solution to the post-deadline election result, offering alternative front pages or headlines declaring both a victory and a defeat for the incumbent. On Europe's streets, there was almost universal satisfaction about Obama’s triumph, although most people confessed their reaction was less upbeat than it had been in 2008. No longer seen as shining beacon of hope, Europeans now see Obama simply as a president who wouldn’t create too many foreign-policy headaches, would work well with Europe's liberal leaders and may offer better prospects for the environment. "He's a steady hand on the helm," said Keith Ellis, 66, a retired pub landlord from London. "He's pretty well respected around the world and is seen as someone who isn't going to upset the boat. A different president might have been a bit more trigger-happy." Environmental technology student Lawrence Webb, 24, conceded that a Romney victory would not have been "a completely bad thing," but Obama's win was cause for optimism. "Hopefully Obama can sign America up to some binding carbon-reduction targets." Guillemaim Thibault, a receptionist from Mont St. Michel in northwest France, welcomed Obama's win, but predicted a mixed response from compatriots jaded by the declining popularity of Hollande's government. "There are a lot of people who think Romney would be great, a strong man for the USA," he said. "France likes the idea that Obama is a Democrat, but more people like the strong-man image." Andrea Bortolotti, an architect from Trento in northern Italy, said the US election was a welcome distraction for people facing turbulent economic and political times at home. He said the outcome was also welcome. "Obama represents an image of politics that brings ideas that are meaningful rather than the Republican way of solving problems,” he said. Irish marketing executive Una Murphy said Obama's victory was “fantastic news” because the president looked more favorably at controversially low corporate taxes in her homeland than others who accuse the country of acting as a financial haven. "He's a good friend to Ireland," she said. Mark Tiernan, an elementary school teacher from London, took a broader view, cautiously hailing the result as a victory for a planet wary of the hawkish policies many would have expected from Romney. “The world is a slightly safer place this morning,” he said.